This is the second in a series of blog posts highlighting some of the new features which will be available in the redeveloped SUNCAT. In this post we are going to focus on how the post search filters will improve the new service, enabling the use of faceted browsing to lead users to the most relevant journal titles and holdings for their needs. Post search filters will be available from the search results display, down the left hand side of the results list, and will provide similar functionality as you will be familiar with via other discovery services and many commercial shopping and travel websites. 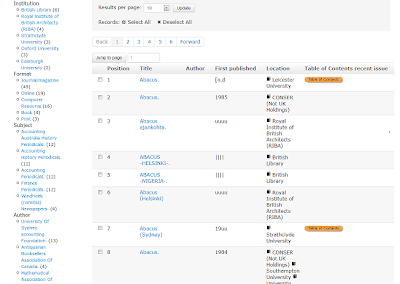 Each filter will also display the number of records in the results set associated with it. The five most common filters from each result set will display for most of the facets, with the option to view decreasingly common filters also available. However, in the case of the institutions facet, filters will be displayed alphabetically to allow you to skim down the list for particular institutions, and in the year facet, filters will be displayed in reverse chronological order. You will be able to combine filters to drill right down to journal titles matching quite specific criteria, but you will then also be able to simply remove filters to widen your results back up again. An interesting side effect of displaying the filters is that it is now possible to easily see the variation present in the records supplied to SUNCAT, which goes a long way to explaining why not all the records which we would like to match together do! Part of the next step of the development work will be to try and amalgamate some of the filters so that they display in a more manageable and helpful fashion. For example combining year filters containing no numerical characters, such as “||||”, “uuuu” etc. into one “Unknown” filter. 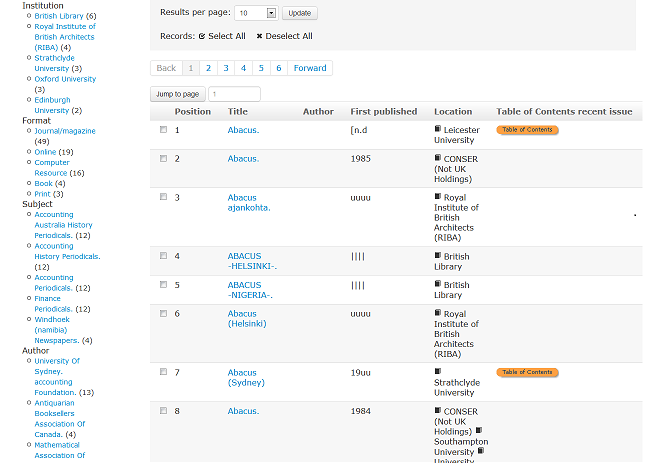 Also publication place filters such as “london”, “London.”, “London,” etc. into one filter for “London”. As we posted a few weeks ago a preview of the new look SUNCAT service is available at http://test.suncat.ac.uk and a huge thank you to all who have sent us comments so far. We would also encourage you to circulate details of the preview service and the survey as widely as possible. Both the survey and the preview will only be available until Monday 13th May, but development work will still be continuing and so we will have more posts to keep you up to date with progress. Please take a few minutes to let us know what you think!